Sticky Rice and Thai Custard or Thai called “Khao Niaow Sang Khaya” A classic Thai dessert and HEAVEN! If you like sticky rice, you're going to love this very simple but exotic Thai dessert! Soak sticky rice in the water for 3 hours. After that, drain it and steam on boiling water for 20 minutes. While we’re waiting for the rice to be cooked, prepare coconut milk to mix with it. Add sugar and salt into the coconut milk cook until it’s boiling. Remove when the sugar is dissolved. Pour it over cooked sticky rice. Make sure the rice is still hot when you pour coconut milk. Now, mix it very well and keep it in closed container for 10 minutes. After that, stir it again and leave it close for another 10 minutes. Add concentrated pandanus juice, coconut milk and sugar and mix it well. Steam the mixed eggs for 20 minutes and then we got custard. 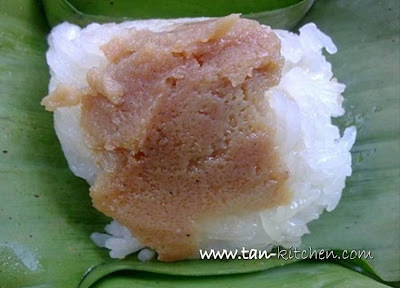 Place sticky rice on small plate and topping custard on it.